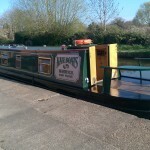 Rebecca is a 47 ft all-steel cruiser stern narrowboat, with accommodation for two people. 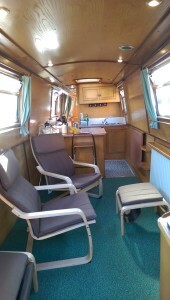 Giving clear views over a low bow, the lounge area is located in the fore cabin. This features a pair of comfy chairs. An unusual touch in the galley is provided by a breakfast bar with stools below and elsewhere all modern conveniences are present and correct including oven with four burner hob and grill, fridge with freezer compartment and plenty of storage space. The bathroom is located at the centre of the boat and as you would expect, comes complete with shower, hand wash basin and fresh water flushing toilet. A permanent double bed is housed in the rear cabin, with storage space underneath and large wardrobe and lockers providing spacious storage areas. A warm and cosy atmosphere is maintained at all times through central heating provided by a gas Alde boiler. Rebecca is also carpeted throughout, and a 240 volt electric supply is available through standard three pin sockets.